IMO State governor, Owelle Rochas Okorocha has boasted that nothing would stop the All Progressives Congress, APC, from taking over Anambra State in the November 18, 2017 governorship poll, urging the state governor, Chief Willie Obiano to start writing his handover note to an APC governor. 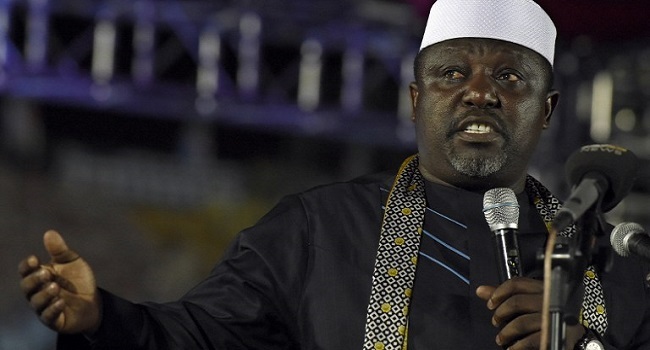 Okorocha, who spoke through Dr. Simon Nwulu while inaugurating the Rochas Peoples Movement, RPM, in Anambra State, said the main objective of the movement was to register grassroots presence in every nook and cranny of the state. He said: “The Igbo can no longer belong to regional political parties. We must belong to the mainstream. APC is that place to belong. “Anambra is critical in Igbo politics. So we shall all come down here to deliver the state to the ruling All Progressives Congress. We have the capacity; we have the capability. “APC is the structure for the emancipation of the Igbo nation and no man born of a woman can stop us from taking over Anambra State after the November 18 election. “At any polling unit during the election, at least 63 members of Rochas Peoples Movement will be present to man the units and protect our votes. That will be the magic. He asked the members of the movement to have their voters’ cards handy, saying that would be a major criterion for confirmation of appointments in the next APC government in Anambra State.